Sullivan Fortner photo courtesy of the artist. 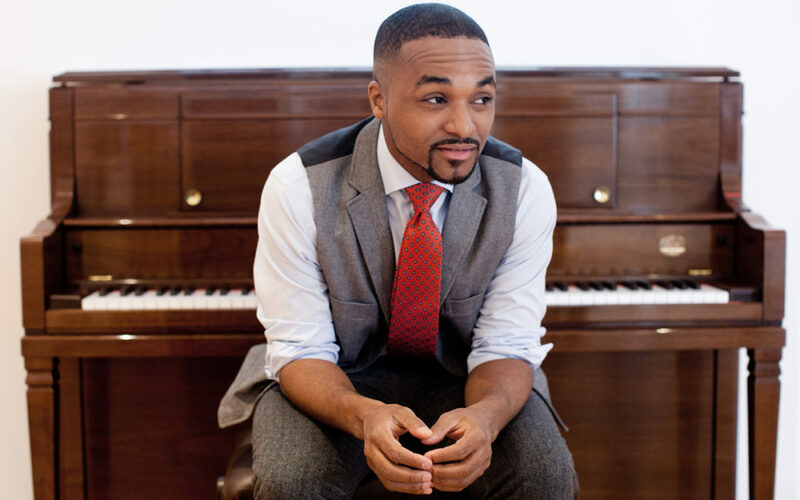 Pianist and composer Sullivan Fortner is a rising star taking the jazz world by the sweetest of storms. He presents his trio with Ameen Saleem (bass) and Jeremey Clemons (drums) for the Earshot Jazz Now concert series on April 10. Hailing from musically rich New Orleans, Fortner began playing piano by ear at just seven years old. By 13, Fortner was already an award-winning musician and enrolled at the New Orleans Center for Creative Arts (alums include the Marsalis brothers and Terence Blanchard). A gifted student, Fortner graduated both from NOCCA and his high school as valedictorian of his class, at the same time. Continuing his education, Fortner received a Bachelor of Music degree in Jazz Studies from Oberlin Conservatory and a Master of Music in Jazz Performance from Manhattan School of Music. Fortner’s s virtuosic promise as a young man has been realized as a poised and brilliant performer, now in his early thirties, hailed by the New York Times as “a wondrous player, light of touch and vested with fleet, dazzling power.” A multiple award-winner, Fortner has received the Lenore Annenberg Arts Fellowship, the 2015 Cole Porter Fellowship from the American Pianists Association, and the 2016 Lincoln Center Award. He’s performed across the world and in renowned festivals including the Monterey Jazz Festival and Newport Jazz Festival. Of course, Fortner hasn’t been a solo success—he’s learned from and given back to some of the best in the business. He’s apprenticed in the bands of Stefon Harris, Roy Hargrove, and Christian Scott aTunde Adjuah, and with pianists Fred Hersch and Jason Moran, as well as working with the Marsalis family, Diana Reeves, Paul Simon, Gary Bartz, and many other notable musicians. Fortner has appeared on albums with trumpeters Roy Hargrove and Etienne Charles. He is celebrated for his recent work with groundbreaking vocalist Cécile McLorin Salvant. Salvant’s album, The Window, a duo with Fortner, just received a Grammy-Award. As a bandleader, Fortner has released two albums. His debut, Aria (Impulse Records, 2015), showcases standards and original compositions with much-lauded aplomb. Dan Bilawsky writes that “each of those numbers points to different facets of Fortner’s artistry, and when taken together, they help to show how expansive his skill set really is” (All About Jazz). Aria offers up classical European music and melodies from the great American Songbook alongside Afro-Cuban and Creole music from his hometown of New Orleans. Fortner showcases his adept ability as a leader to elicit inspirational playing from his band. “The rhythmic brio and harmonic insight in the band can be heard all over the album” (Nate Chinen, New York Times). On Moments Preserved, “Fortner and his trio cover Earth, Wind & Fire, Duke Ellington, and even songs from Wheel of Fortune and Mister Rogers’ Neighborhood. The underlying theme is an emotional honesty that connects Fortner to moments from his own life experience” (Nate Chinen,WBGO). Fortner is a savvy artist who exudes talented playfulness and a zest for recombining influences into something poignant and refreshing. Advance tickets are $20 adults, $18 Earshot members and senior citizens, $10 students and military, and are available at earshot.org. Day of show tickets are $25 adults, $23 Earshot members and seniors, $10 students and military.